Interview with Watch Cufflinks Home | About Us | Opportunities | Sponsorships | Contact Us! I was so excited to interview Ricky Wolbrom at Watch Cufflinks. This Master Artesian is a visionary designer and has a fine eye for detail! She utilises classic watch parts to create her masterpieces, some ornate components are even from the 18th Century! I am very pleased to showcase Ricky and her fine handcrafted wares, I hope you all enjoy the article! 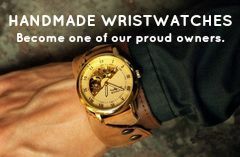 Watch-Cufflinks.com features jewelry and accessories that are entirely hand-crafted by artist/designer Ricky Wolbrom – that’s me! One of the major focuses of my site is men’s watch movement cufflinks, including many high-end luxury watch brands, but I also enjoy creating a full range of watch jewelry: rings, necklaces, bracelets, etc. I even have a section devoted to women’s jewelry because I want men to be able to select beautiful and unique gifts for that special lady in their lives. What got you started in creating and designing the various pieces Watch Cufflinks offer? I have always been involved in creating things by hand, and I have felt a particular connection to the Vintage aesthetic. People have been using watch components in jewelry for a couple of centuries. For example, I have a necklace that is comprised entirely of specific pocket watch pieces that date back to the 18th Century. These pieces are extremely ornate and lovely, but pieces such as this are rare and were created only on an informal basis. When I first encountered this jewelry concept, I fell in love with the aesthetic and immediately saw the potential for a full range of designs with virtually limitless creative potential. Tell us about your most prized creations. 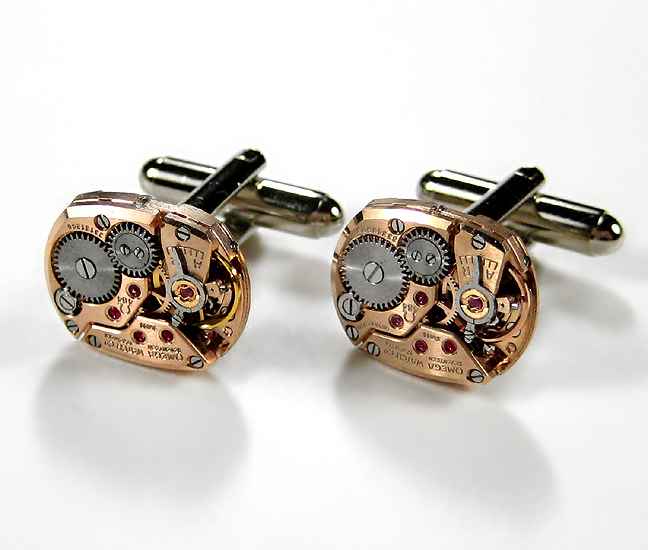 These cufflinks feature a stunning pair of genuine Omega watch movements. Here, the original beauty of the exceptionally renown and breathtakingly constructed Omega Watch Company mechanisms speak for themselves – striking timepieces in rose-gold plate torch soldered to silver cufflink backs. This is a timeless and classic look. 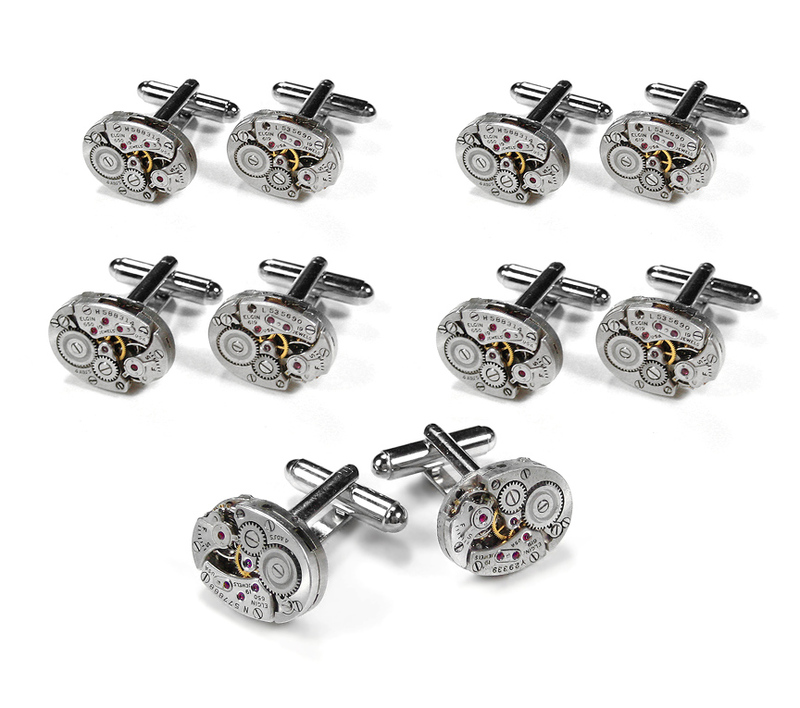 This is our gorgeous set of 5 popular Elgin brand watch movement cufflinks. Take time to appreciate both the beauty and the quality of these amazingly tiny little mechanisms. This five piece ensemble serves both as a unique and thoughtful gift for your groomsmen as well as something they can wear the day of the event. All of the cufflinks and jewelry are meticulously torch soldered by hand to ensure that they will last a lifetime, as well as serve as heirlooms for future generations. 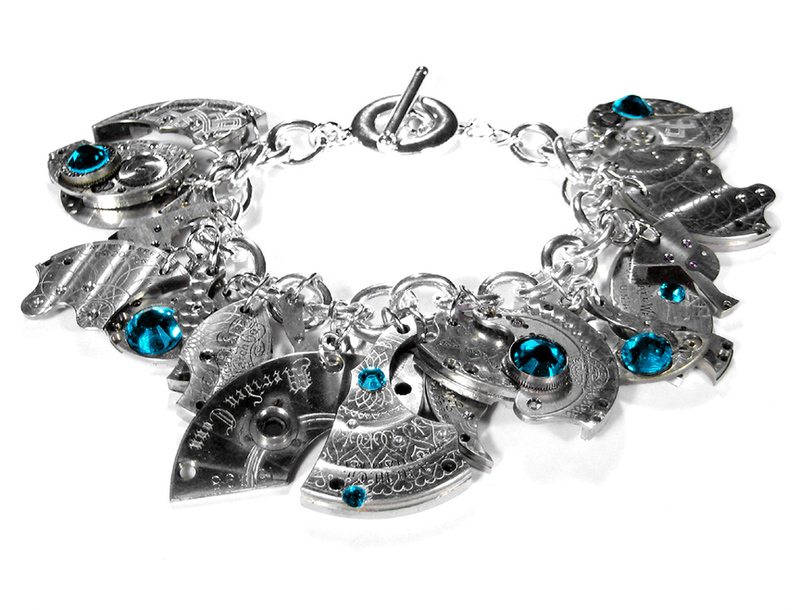 This one-of-a-kind Silver Antique Watch Parts Dangle Bracelet with Swarovski Crystals is pieced together by hand from antique wrist watch and pocket watch parts. The bracelet is available without crystals, or with turquoise Swarovski crystals as seen here, or people can pick the Swarovski crystal of their preference. 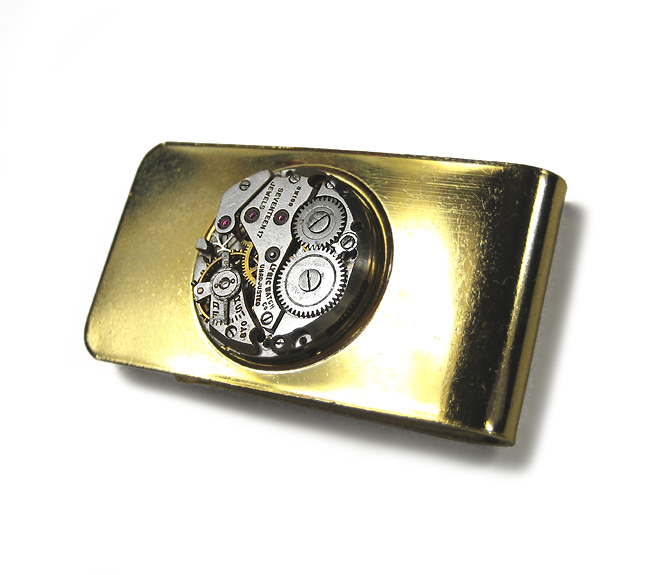 This gold finished Money Clip features a handsome round watch mechanism with genuine ruby jewels. The piece is torch soldered for the ultimate in durability. Why do you think that handmade items are a great option for men? Why should guys support handmade? Why should people buy handmade for the men on their lives? This is a great question and there are so many reasons. First and foremost, it can be very difficult to shop for men in general. Hand made items open the door to a vast array of amazing products that many people have no idea exists. By supporting these artists, the variety and availability of these products will only continue to grow, aside from the obvious economic implications of encouraging these individuals and small businesses. And the ultimate benefit for anyone shopping for the important men in their lives is the opportunity to give extraordinary and unique gifts of exceptional quality that truly stand out from the standard fare of mass-produced goods. What inspires you to artistically create your designs? My main inspiration comes directly from the raw materials with which I work. I can see pieces coming together in my mind as I look over new materials that I acquire. There is never enough time to create all of the ideas that I imagine. Tell us about the most intriguing custom design you have been asked to craft? I have been asked to create jewelry from watches and accessories that belonged to lost loved ones, which always inspires me to produce the finest jewelry possible – it is challenging to live up to the standard of someone who has come before you, and means so much to the person making the request. I have even been asked to incorporate the bones of a cherished pet into some jewelry, which might sound strange until you learn that Victorian jewelry often included hair from a deceased relative, what is known as Mourning Jewelry.